Benson has been also a member of The Raconteurs, a collaboration with Jack White of The White Stripes and two members of The Greenhornes, Jack Lawrence and Patrick Keeler. Benson and White work together in writing the songs. The group’s debut album, Broken Boy Soldiers, was released in the U.S. on May 16, 2006, with “Steady, As She Goes” the first single. 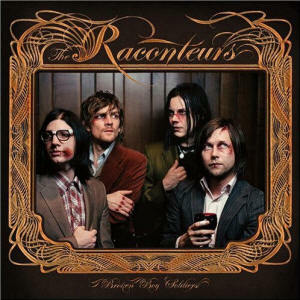 The Raconteurs released their second album, Consolers of the Lonely in March 2008. Broken Boy Soldiers is the debut album of The Raconteurs, released on May 15, 2006 in the United Kingdom and May 16, 2006 in the United States. The album was generally favored among critics and spawned the #1 hit single “Steady, As She Goes”. All songs by Brendan Benson and Jack White. Consolers of the Lonely is the second album of The Raconteurs. It was released on March 25, 2008 on Warner Bros. Records in most parts of the world, and a day earlier on XL Recordings in the UK. The band did no promotion before the album’s release, and its existence was only confirmed a week before. Even so, the record was accidentally leaked by iTunes, and some fans managed to purchase the album early. It is available on all formats including CD, vinyl, and MP3. A video for the first single from the album, “Salute Your Solution” was released on the same day. All tracks written by Brendan Benson and Jack White III except where noted. I love the rac boys. I actually discovered B.B. thru their music. Thanks Jack White for being so great at assembling another wonderful group. I have a friend who keeps asking me to make a chart or someone of which raconteurs songs are sung by Jack and which are sung by Brendan, or by both of them. He swears he cant tell them apart. I searched on oline for a list but couldnt find one, but you might be interested in putting something together. I’m to lazy and to sick of my friend asking.